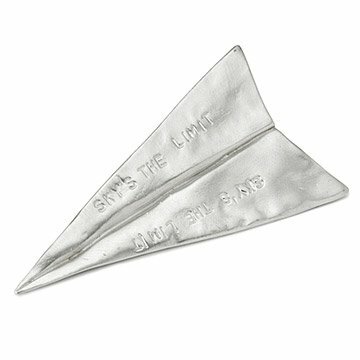 Recall the simple pleasure of paper airplane making with this inspirational paperweight. When you were a kid, a sheet of paper and a few folds made a miniature airplane powered by your imagination. Recall the simple pleasure of that activity with this inspirational airplane paperweight. Made of hefty lead-free pewter, it won't take to the sky, but will serve as a reminder of carefree fun and the limitless potential of the wide-open sky. Makes a great gift for graduation or for anyone who could use a little lift in life. Handmade by Tamara Hensick in Los Angeles, California. Polish with a jewelry cloth. Very cool stuff and great customer service! Very adorable and motivational gift for your desk to be reminded that nothing will stop you and to keep going. My husband's a Small Business Coach and Motivational Speaker who loves airplanes, so this was perfect for his Christmas stocking! indeed i would by this product again. what fun! The perfect gift for the perfect friend!! I have bought several of tthe have in the past and was disappointed that the had been discontinued. I was excited to see that they're back until I see the price has almost doubled!! Why?? Too bad. Can't buy more with this new pricing. Unique & inspirational, loved it!!! Graduation gift for airplane enthusiast. Everyone loved this unique gift with it's inspirational message. Picture does not do it justice. Very nice!!! I was flying high when this product arrive. Unique and fun! This made the perfect graduation gift for someone special. Wish I had one for myself! It was so unique! It was the perfect gift for an avaiation student.